SpaceX says its experiment to bring part of its Falcon rocket down to a soft landing on a floating sea platform has failed. The vehicle was launched on a mission to send a cargo capsule to the International Space Station (ISS). Once the first-stage of the rocket completed its part of this task, it tried to make a controlled return. SpaceX CEO Elon Musk tweeted that the booster hit the platform hard. “Close, but no cigar,” he added. SpaceX intends to keep trying. If this kind of capability can be proven, it promises to dramatically lower launch costs in the future. It would mean that normally disposable rockets could be recovered, refurbished and re-used. It might also point to new ways of bringing spacecraft back down to Earth in general. 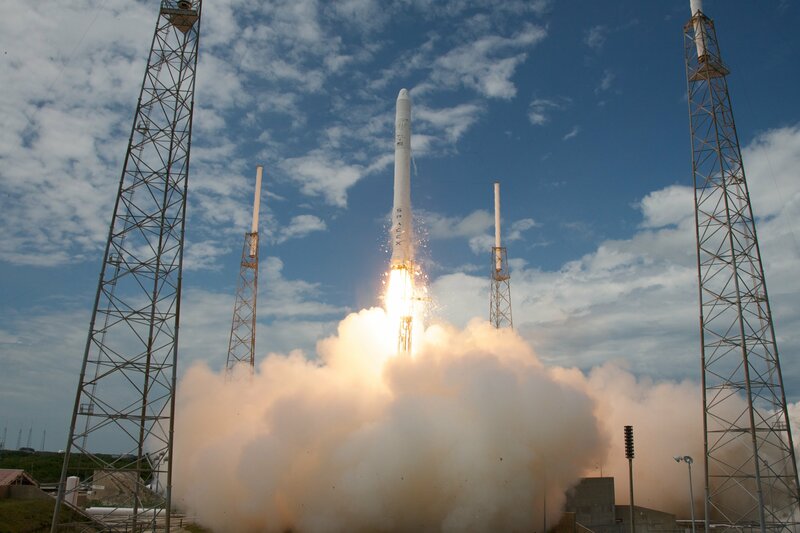 Lift-off from Cape Canaveral, Florida, for the Falcon 9 with its Dragon freighter occurred at 04:47 local time. The cargo ship was confirmed in orbit and en route to the ISS nine minutes later – at about the same time the first stage was expected at the drone ship. Dragon’s arrival at the station is set for January 12. This is the first American re-supply mission to the orbiting platform since October’s spectacular explosion of a freighter system operated by competitor Orbital Sciences Corporation. Traditionally, rockets have had an expendable architecture. As they head skyward, they dump engines and empty propellant tanks to save the weight that allows their upper-stage, including the satellite payload, to make the jump to orbit. Any discarded hardware simply tumbles back towards the planet and is torn apart. This approach means every new mission needs an expensive new rocket. SpaceX, on the other hand, believes it can recycle key elements of its rockets. The company has been testing first-stage boosters that relight their engines to try to slow their fall through the atmosphere, attaching fins to help guide them downwards and legs to make a stable touchdown. Until January 10, these were all mock landings, in which the stage was brought to a hovering position at the surface of the ocean, where, without a solid platform to set down, every booster was then subsequently lost into the water. This latest experiment marked the first use of the drone platform. SpaceX conceded that reaching this touchdown pad at the first attempt would be an immense challenge. The barge is less than 100m wide, and all previous experiments had been working on a landing accuracy of some 10km. Nonetheless, SpaceX will be encouraged that it got so close to the platform.